And now, those three words will be stuck in your head all day long. Milwaukee released a new team song Wednesday night, debuting a tune the Bucks hope will be their anthem deep into the 2019 postseason. It’s a remake of a team song the Bucks released back in 2000, when players like Ray Allen, Glenn Robinson and Sam Cassell were in Milwaukee leading the Bucks to the Eastern Conference finals. Taking on head coach Mike Budenholzer’s philosophy of creating space, playing faster and (most importantly) chucking up 3s, the Bucks shattered a franchise record with 1,105 3-point makes in 2018-19. Milwaukee’s previous high in a single season was 720 in 2016-17. 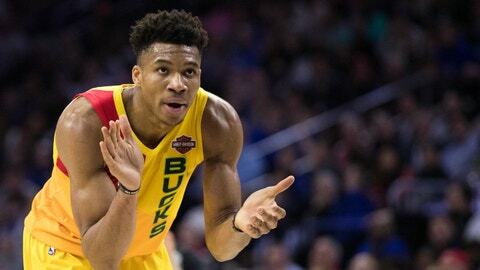 The top-seeded Bucks, who tallied 60+ wins this season for the fifth time in franchise history and the first time since 1980-81, will take on the eighth-seeded Detroit Pistons in the first round of the playoffs.